Understanding a natural intelligence is the most systematic way of developing the internet of things. We know that each single-celled organism tries to survive. They usually follow the rule of “do the right thing at the right time.” In reality, IoT solves the same simple problem for communication points that agriculture intelligence has tried to solve for many years: precision farming. Different machines, animals and plants on different fields try to communicate with each other, as well different IoT devices. If we were to try to use IoT in a large scale in the agriculture industry, we would have to build a suitable large architecture. Low-energy networks can provide connectivity only on one site and often do not exist in remote areas. This means the communication with the combine on the field will be always insecure. Because of need for large-scale investigation and reduced maintenance efforts, cellular connectivity could be the right means of communication for modern farmers. The United Nations predicts an increase in world population to over 11 billion by 2100. All of these people will have to be fed. Farmers face a set of challenges: an increasing worldwide demand for food, a changing climate, and a limited supply of water and fossil fuels. In addition, unsustainable farming is having negative environmental impacts. Farming of the future has to be more efficient and reduce environmental pollution at the same time. 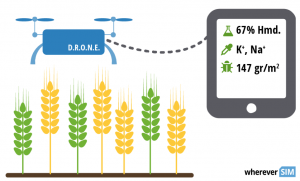 Precision farming is a new farming management concept tailored to the specific conditions of every field, which uses sensor integration, automatic control, information processing and network communications capabilities. To provide a suitable growth environment for the plant in a more energy-efficient and cost-saving way, farmers could use the system for remote monitoring and factory automation management. The goal of precision farming is to not only simply generate data via sensors, but to analyze that data to evaluate needed reactions. Smart farming application areas include farm vehicle tracking, livestock monitoring, field observation and storage monitoring. Sensors also have the potential to be mounted on animals. Farmers can monitor the health and well-being of livestock, as well as the surrounding environment. It could notify a farmer that an animal is sick, thereby preventing the spread of disease. Controllers can manage self-driving tractors remotely, providing significant cost savings. Infrared camera can identify pest-infested crops and weeds, and therefore herbicides can only be applied where and when they are actually needed. New methods of biologic pest control are more precise and cost effective. The immense effort of permanent caretaking is supported by new technologies. 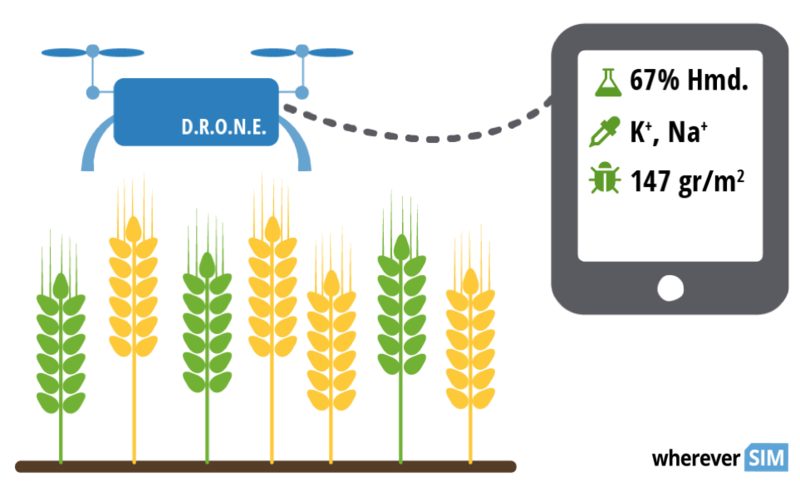 Drones with multinetwork connectivity can detect water and nutrient deficits, and analyze soil conditions and the degree of ripeness of crops. This data is transferred to the farmer’s software application immediately through a GSM network and enables a resource-saving, environmentally friendly precision farming of the land. Real-time monitoring of connected devices is fundamental for collecting data. It also includes monitoring on the farmers side, which may help control measures like changing parameters for suitable precision farming, such as if too many or too few data has been collected, or if a specific sub-area on the field must be covered better. Observations may also lead to the creation of new data collection tasks for sensors. Farmers could follow a drone’s journey in real time since it has a tracker that can transmit its position via a mobile network to the special software or even website every few second. Being on the field the whole day, it is essential for farmers to have a tracking solution that would also work in remote areas and across borders. Hence, choosing a SIM card that could use every network is a critical component of the whole project. SMS can play a role as an intermediate solution in large areas, helping with device distribution or middleware. However, a GSM network always can be used, even if an internet option is not available. This makes cellular a reliable and persistent channel for loT connectivity in agriculture. Consider the opportunity of direct control over all SIM cards as one of the most important features, where a farmer can manage data in real time and check and adjust data usage, location and status of the devices in the precision farming portal or via an API. Despite future opportunities, there are limits that are holding IoT back. One of them is the power problem of a long-term sensor deployment. The main drain on power is the use of GPS and the transmission of any data via GPRS. However, there are some novel power approaches available with low battery consumption such as a solar panel solution. Additionally, deep analysis allows reduced data upload rates and increases the reliability of networks. Yet cost and public perception are two other barriers to the continued developments of the technologies. In the future, the agriculture industry can help accelerate IoT development. Data from each field will hold extremely valuable insights for smart precision farming. We are creating new complex networks and interconnected devices right now that can share infinite amounts of information. This will be fast and uninhibited. It is not a science fiction anymore; these innovations will be borne of loT and cover the globe, as cellular solutions can achieve an unbelievable level of observing any events on the field. Sigfox would be a much better solution than the limited GSM coverage in an Agricultural environment due to the distances required to be covered. Sorry, for me there is absolutely no point in your comment. How is GSM coverage limited? Sigfox, if at all, would only be an alternative in few countries. Currently maybe 20 countries are (poorly) covered, so you better prepare to have different solutions in different countries - will be fun to manage that. For developing countries like Africa, Sigfox would not be an option at all, because it’s not available there. Same also in the U.S. - no coverage - and in European countries like Germany, Austria, Switzerland or Poland because Sigfox does not meet the regulations. In Europe you have may have poor reception in Italy and Spain, so Sigfox is from my point of view no real alternative for GSM. If you have any further information, please feel free to explain me more. Right now, I don’t see your conclusion. Do you think is it available, below? For example, in the case of potatoes, if a large number of farmers grow potatoes this year because of high harvest last year, the overproduction of potatoes will cause the price of potatoes to drop, and a lot of potatoes will not be sold. As a result, there will be a problem for the farmers to determine the proper cultivation of crops in the following year. Can IoT be used to solve these problems as well? For example, in the form of IoT Farming.